Sunday is comfort food day in my house. Yes…after the end of a work week, school week, a rough week, or whatever you want to call it, Sunday’s call for comfort cooking at home. Pasta is always the request, with gooey melted cheeses, noodles, some sausage, throw in some summer zucchini and viola- you have an easy comfort food that will disappear real quick, no left overs here! 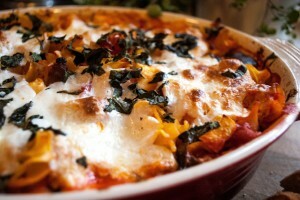 I came up with this baked pasta with zucchini when my kids were little. The last thing I wanted to do was cook for hours in the kitchen after chasing them around all day, soccer practices, work, and then there is cleaning the house. I wanted something other than the usual spaghetti pasta dish. I boiled some noodles, grabbed some pasta sauce, sauteed some onion and garlic with sausage and tossed it all together. 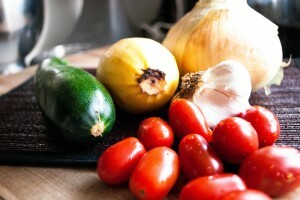 And to get the kids to eat more veggies- I tossed in some zucchini and squash. Top it with some freshly sliced mozzarella and fresh basil, then put it in the oven and forget about it for 25 mins. Ahhh….25 mins of me time, I will take it when I can! 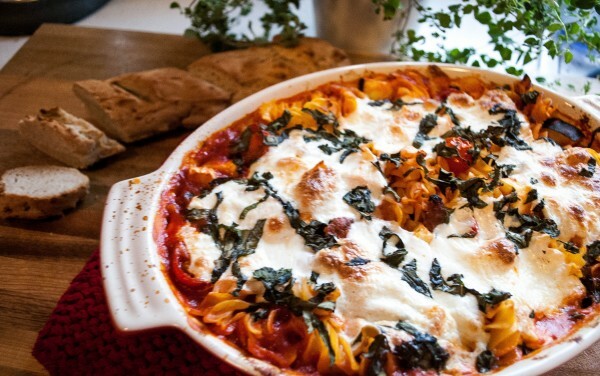 Ready for the oven, topped with fresh sliced Mozzarella and Basil…. Hot and bubbly from the oven, ready to devour! Bon Appetite! 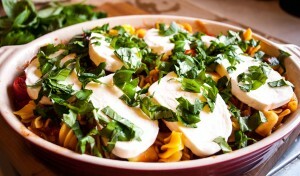 What is your favorite go to pasta dish when “comfort food” calls your name? Comforting pasta baked in less than 30 mins. Cook and drain pasta. While pasta is cooking, saute chopped onion and garlic for 3-4 mins. Add sausage and cook another 5 mins or until sausage is no longer pink in the middle. In a medium casserole dish, toss in cooked noodles, sauce, sausage mixture, and chopped vegetables. Add slice mozzarella on top, then chopped basil. Bake for 25 mins or until hot and bubbly.